I am now an authorized COBRA machinery dealer. 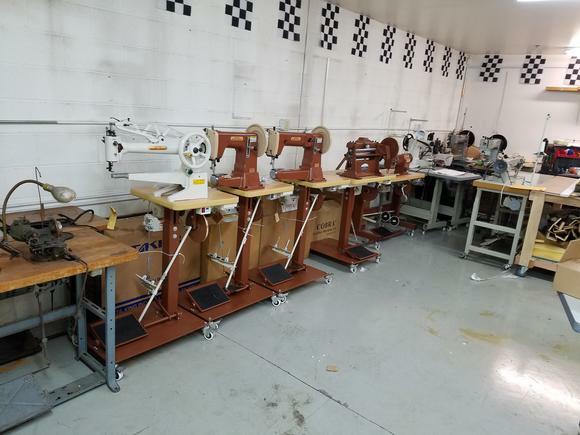 I buy, sell and trade used shoe repair machinery and industrial sewing machines. I also have different bench machines and hand tools related to leather work, boot and shoe making and saddlery. The machines I acquire come from many sources across the country. I often travel to purchase them and some are shipped in via freight carrier. I also freight them out. I take equipment to sell at trade shows like the Sheridan Wyoming Leather Debut and the Boot and Saddle Makers show in Wichita Falls Texas. I generally service the equipment I resell if it is needed but it is important to know that I am selling used equipment and even though I try to represent the condition to the best of my ability, I do not waranty any of it. It is sold as-is. My goal is to help keep equipment of the trade in the hands of artisans in need of good used equipment. I buy entire lots or business' often from retired individuals and estates. I am buying to resell and therefore usually offer more of a liquidator price but my prices are largely based on what I find todays market will sustain. I have thousands of machine needles and parts. If there are special items you can't find I may have them. I also have hundreds of steel trimmers for finish grinder machinery. Look for them on my Ebay sales under "J.B.CUSTOM" seller. Please contact me with equipment you are looking to buy or sell. Landis, Sutton, American, Singer, Adler, Champion, Stanley Bostitch, Autosoler, Ferdinand and more.